We've always wanted to water canon some rioters. Emergency 2012 throws up some formidable scenarios. 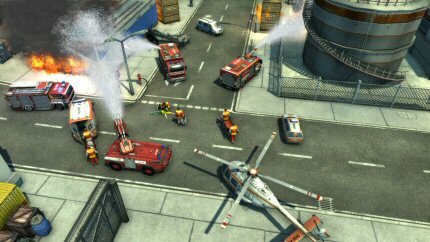 The real-time strategy game/disaster simulator sees you in control of the emergency services as you attempt to save lives following a series of natural disasters, terrorist threats and tragic accidents. Among the 12 missions available in campaign mode, you’ll attempt to rescue survivors from a crashed plane in Moscow, frantically try to stop a fire from spreading after a truck crashes on London’s Tower Bridge, and even try and deal with a mob of armed rioters and looters who have taken to the streets of Paris. Action takes place from the top-down perspective and you’re tasked with controlling and commanding units to complete objectives and save lives. In this case, the four units under your command are Police, Firemen, Paramedics and Engineers. Each unit has its own strength and command list, so you might use an engineer to prize open the roof of a crushed car to get to a survivor, for example, or rush a paramedic over to help an injured man on the floor. There's a variety of different options and it's up to choose what you think will help the cause, perhaps using a policeman to shepherd civilians to safety, or commanding a fireman to whip out his hose and douse flames. The best way to explain how gameplay works in Emergency 2012 works is to tell you about one of the missions. One of the earlier missions in the game is set in London. A petrol tanker has jack-knifed on Tower Bridge and caught fire. There are people and other cars on the bridge in danger so you need to get the situation under control. Your starting units are a police car, fire engine and some paramedics. There's a drop-down box at the top of the screen that tells you the objectives you need to carry out, such as getting the police officer out of the car and equipped with a megaphone. If you complete all the objectives efficiently you gain points at the end of the mission and are awarded either a bronze, silver or gold medal for your efforts. Gameplay is really about multi-tasking and keeping an eye on the developing situation on screen. You click and drag units, which you can group together, around the environment responding to the action - perhaps sending the fire-engine forward and extending its ladder so you can send a jet of water toward the flames above, while you command the police officer to move the people on the bridge back from the flames. You'll also need to send paramedics to deal with the injured, before getting them in the ambulance and off to hospital. You constantly have to adapt tactics depending on how the scene plays out. If you don't react in time then things gets progressively out of hand. The fire might start to get out of control, for example, so you might need to send in another fire-team in, or you may have to rush around dealing with more casualties, even though you have no ambulance because you've sent it off to the hospital with casualties. As the game progresses, these sitations get increasingly chaotic and tougher to deal with and you also get access to more orders and units that give you some tactical freedom, such as the ability to set up road blocks, or summon rescue dogs.